Man Meets Bear started out initially as a solo project of Soren Little Brothers, an ecological biologist from Canada. A short look at his Bandcamp page suggests that he has been very busy since 2008, with 16 records having been released already. Buffalo Comets is his second longplayer with a full band, where Soren on vocals and guitars is joined by Dave Dunnett on bass and drums, and Evelyn Malinowski on keyboards. Buffalo Comets has been recorded in Berlin, Germany during the summer of 2013, and the band’s proximity to Danish experimentalist / singer-songwriter Jacob Faurholt has definitely left its traces. What has started out as very basic lo-fi music has turned into a richer sound, without giving up its erstwhile approach. The opener Eat The Brains shows the band from its more experimental, dare I say: tribal, side, but sets already the course for what is to come. The following Spores Of The Mind combines indie, folk and pop elements, melding it together in a finely blended lo-fi sound, where the mastering skills of James Plotkin (Sunn O))), Nadja) certainly helped to bring out the details. From here on, the trio continues in that vein, conjuring pastoral atmospheres where the melodies are often hidden beneath a slightly murky, yet always pleasant sound. This way the album is maybe not instantly accessible, but repeated listening will reveal further wonders, rest assured. The middle of the album surprises with the ten minute long Sun Goes Down, a rather meandering track that doesn’t try to repeat the recipes of the shorter material, but rather is an enlightening journey through the songwriter’s mind. This may not be hit material, but definitely has a reason to exist, if only to remind the listener that Man Meets Bear come from a more basic starting line. The final songs once again are mostly shorter, and even if they can’t always reach the ingenuity of the album’s first half, I wonder if that could be cured by just giving these tracks some more chances. The early albums of Man Meets Bear always came with cover artworks depicting nature scenes. 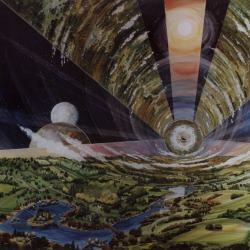 This time things are different: the inside of an O’Neill cylinder is a science fictional motif and reminded me instantly of Arthur C. Clarke’s "Rendezvous with Rama". That, and the commendation of Jacob Faurholt, were of course a strong motivation for me to review Buffalo Comets. And I didn’t regret it! So make sure to check out Soren Little Brothers and his band’s new album, and then maybe dare to make it through their back catalogue. You will not regret it.